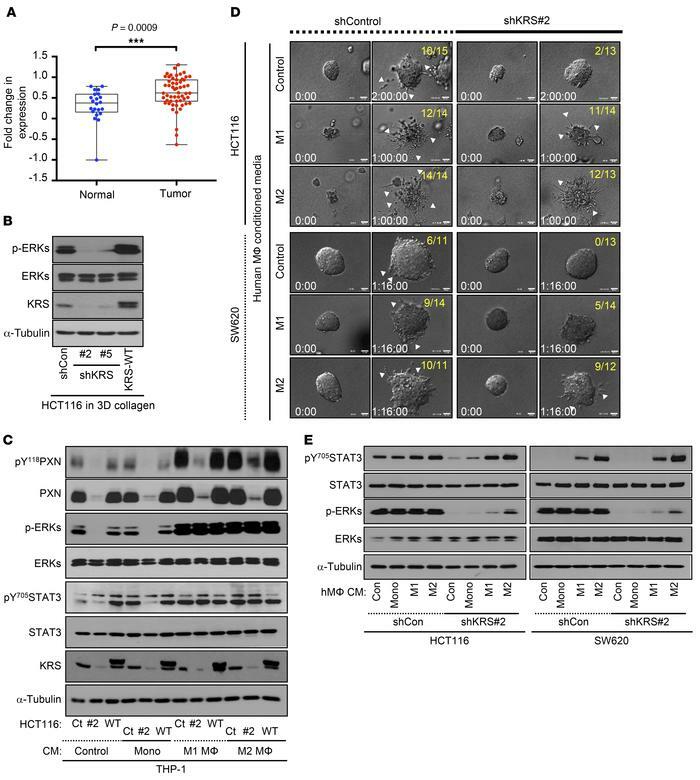 Cell dissemination from KRS-positive colon cancer spheroids embedded in 3D collagen I gels is promoted by the conditioned media of M2 macrophages. (A) Public Oncomine data analysis showed overexpression of KRS in colon cancer patients. The data are presented as the mean ± SD. ***P < 0.001 by Student’s t test. (B) Colon cancer HCT116 spheroids (using shControl, KRS-suppressed shKRS#2 or shKRS#5, and KRS-WT–overexpressing stable cells) in 3D collagen I gels were analyzed by standard Western blots. (C–E) HCT116 or SW620 spheroids in 3D collagen I gels were time-lapse-imaged for the indicated periods (0d:00h:00min) after treatment with conditioned media (CM) of THP-1 (C) or normal human monocytes and differentiated macrophages (D and E). After imaging, whole extracts prepared from the spheroids were normalized and immunoblotted (C and E). Spheroid images include yellow fractions to depict the phenotypes observed (numerator) out of the total spheroids (denominator) analyzed (D). Scale bars: 40 μm. The data shown represent 3 independent experiments. See also Supplemental Figures 1 and 2.